The lovely Charlie from Lady of the Lane (Which i must admit is a fabulous blog, who i have been following for a long time now!) is guest reviewing some nail bits and pieces from Viva La Nails. Without further ado, take it away Charlie! I was busy tweeting one evening and was wondering if anyone had any recommendations for Nail Art supplies as I fancied a play with some diamante’s and sequins...I only had one reply and that was Sinead asking if I fancied doing a guest review of some nail art supplies from Viva La Nails that she had needing to be reviewed. Of course I did! A day or two later this amazing collection of bits and pieces arrived through my door. I absolutely couldn’t wait to get going and started looking through all the little packets and trying to decide what to do. First thing I noticed was that there are no instructions. This made it impossible to tell what kind of stickers there were, were they water decals, or normal stickers, did they need a top coat over the top or not? So the obvious answer was to look them up on the Viva La Nails site. Fail number two. There are no names on the packets either. If you’ve never looked at the site then you won’t know there are thousands of products on there, trying to find the exact item you are clutching in your hand on the site is nigh on impossible. In fact I’d go so far as to say I’m pretty certain half the products weren’t on the site at all. So I had to guess how to use things, which as a total nail art novice was no easy feat. Over the next couple of weeks I created loads of looks and there’s a selection of pics below of things I tried. Some more successful than others. The diamantes are incredibly fiddly to use but were my most successful manicures. The stickers, all of them, were total fails. They don’t stick. None of them. They peel up at the edges, even with a top coat. I can’t in all honesty recommend any of the stickers, without a top coat they last half an hour if you are lucky, and with a top coat the edges still start peeling off so you end up with sharp edges. This was really disappointing to me as it was the stickers I was most looking forward to trying. I think the water decals might be more successful but to the best of my knowledge there weren’t any in the selection I received, as I say, if there were I couldn’t tell, none of them were labelled! My imagination totally failed me when it came to using glitter and bits of shell, but I will probably try just putting the glitter into clear polish at some point. Anyway hit and misses, and perhaps some of it is down to my appalling lack of technique. The crystals are lovely, the sequins are too and I think they’ll stick really well, not tried them yet but I should think a top coat will stick them down very well. The stickers however, I can honestly say I would avoid. With a lack of instructions, or even names so you can look them up on the site, then they don’t seem to cater for the novice at all. 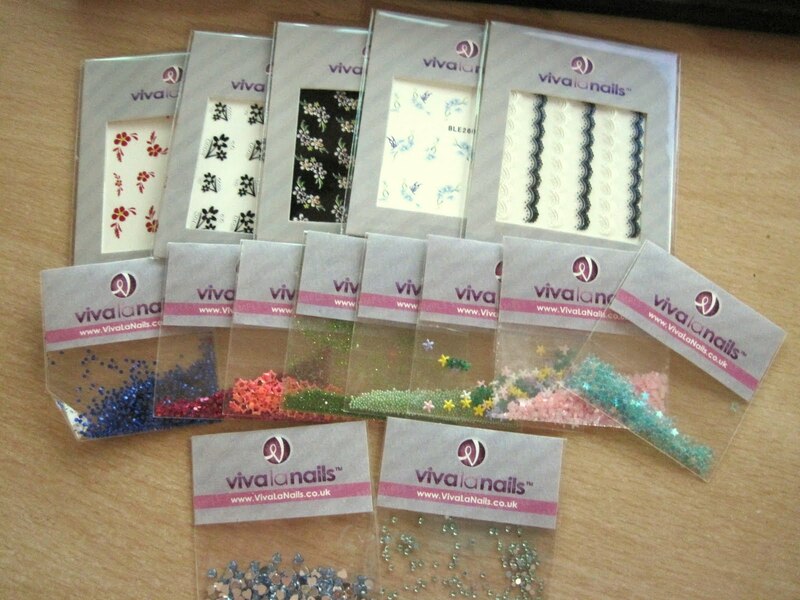 I will however, use Viva La Nails to purchase more crystals and sequins (dazzlings I think they are called on the site). Anyway, here’s some pics of the products in action. This was also a success. And here are some sticker disasters. All my attempts with the stickers had to be removed within half an hour of application. Thank you again to the wonderful Charlie, for testing and reviewing these products for me! If you are interested in reviewing any products for me, please get in touch! As i always have lots of things to get through! Ooo they look so pretty. Great post Charlie! I had so much trouble with the Viva la Nails stickers as well, I thought it was just me being stupid! They are IMPOSSIBLE to keep stuck down, right? Oh and apparently Viva la Nails isn't even meant to cater to novices - in all her youtube videos and bits and pieces on her site she's always addressing qualified nail technicians and professional nail artists so that leaves us a bit stuffed! Oh oh and one more thing, I should warn you now, crushed shell isn't safe to use on natural nails. It's ridiculous that the packet doesn't come with a warning on it for that! I like the gems. The lacy tips look promising. omg does are too cute i love it..! Glad it wasn't just me that failed with the stickers Leanne! If a pro like you couldn't manage them either I'm not as much of a doofus as I thought! I really enjoyed this post. very cute! You created some lovely manicures there Charlie. It's a shame they were so hard to work with. I love the mauve Essie with the starfish. I think that was probably my favourite. Pretty! I like the first ! It's Una here from Viva La Nails. * We do sell professional nail products for professional nail technicians. It's obvious that you're not a professional nail technician and that's why you have failed in applying most of our products. There are different ways & techniques for each nail art category. Like - crushed shells - you can't use them on natural nails, they're for gel/acrylic nail extensions only. 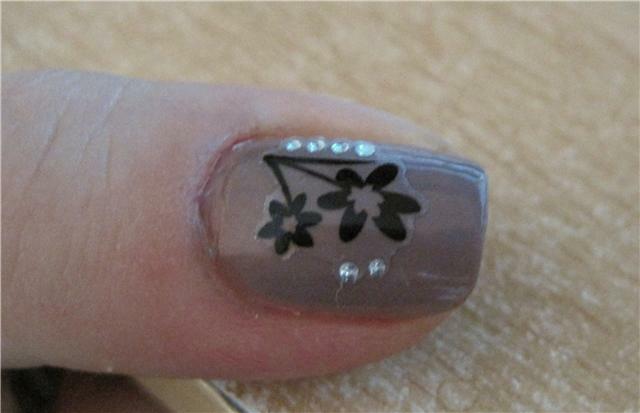 Nail Stickers - they are meant to be sealed down with top coat or a layer of gel. Not sure how you can mix water decals with stickers to be honest :-) But they both require different application technique. In a word - I just think your review is a bit biased because of your lack of skills. Una, I appreciate that you may have been offended by the review as you don't feel it was a fair appraisal of your products. However, I think if you wished to seem professional the tone of your message doesn't come across that way. I think Charlie certainly says she is inexperienced and the review didn't lead me to believe the products weren't any good. I would think twice now though having seen your response to criticism. It seems extremely snide. @Una: Thank you for your comment. However, you did send these products to me knowing full well that i am not a professional nail technician so if your products are only for the professionals im not sure why you have sent them out to bloggers to review? Also, these products came with no instructions whatsoever, obviously people are going to struggle applying these if they dont know how to! If all the information you have just provided was given beforehand the outcome of this review could have been entirely different! I let Charlie review these products as she has a interest in nail art & hasnt once suggested that she is a professional so there really is no need for the criticism and the rudeness of your comment. I really do think there your comment has let down your company here and i would have assumed that your company and potential customers would want honest reviews of your products? Una, why are you sending sample packs to bloggers for review as per your website if they are for professionals http://www.vivalanails.co.uk/samples.html. You do realise that most of us are not nail art experts? I mention in my review I know nothing about nail art. I also mention that I have attempted to seal the stickers with top coat. Perhaps you should reread my review. I experimented both with top coat and without. I even say that even with a top coat they came off in a very short amount of time. Not impressed and I take back my recommendation to your site and will be blogging as such. To reiterate, you are sending out sample packs to bloggers and you tubers, not nail professionals, with no instructions or warnings, about crushed shell for example, and then get defensive when we have no clue what to do with them. Re your snide comment about water decals, having never seen any, how would I know the difference. I enjoyed playing with the items I received, but sadly, this has tainted any good words I had to say about them and I retract any recommendation I make. Gosh, there are quite a few points here. To start with, I'm coming from the angle of a professional nail technician. If the packs are being sent out to bloggers who are not professional nail people, then it should stop. Bloggers are not necessarily going to have all tools and knowledge on how to apply nail art items at home. Viva la nail should not have sent out anything that needs a professional application. I wouldn't send out gel nail samples to a blogger, it doesn't make sense. The blogger is only going to tell it as they experience it and with no instructions the 'blame'quite rightly falls at the door of Viva la nails. 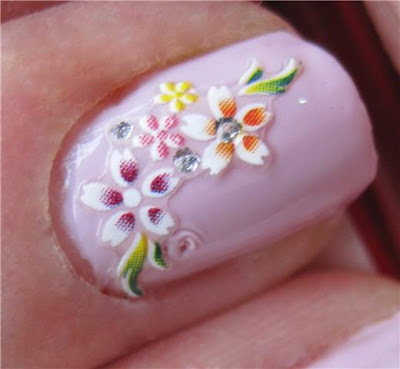 From personal experience, nail stickers can be very tricky to use because as soon as you put a top coat, they start to slide. This is usually when the adhesive on the back of the sticker isn't very strong to start with, as may have been the case here perhaps. Viva la nails certainly has some good products, as the blogger pointed out and I don't think this review would have necessarily stopped people from purchasing products. It simply calls for people to be more conscious of what the are purchasing and be aware of their own personal skill level. However, the response from Viva La Nail may make people question whether to purchase. Yikes, I can only echo what others have already said - why on earth is this company sending out samples to bloggers if the products are only supposed to be used by professional nail technicians? Bizarre! On the plus side, Charlie the looks you have done with the crystals look great. Although I think I'll now be looking for a different company to source something like this from, as the comment posted by the company representative here does not appear to bode well for their customer service! Una, in a word - why the hell offer to send your products to bloggers for review purposes without even asking any of us if we are trained nail technicians. Its a damn good job that when I applied the crushed shell to my nails, that they were false. Otherwise I would have been pretty damn pissed at you for not stating that they are only suitable for false nails. Who sends out products with zero labelling or instructions? Even 'professionals' would need labels surely? Now, after re-reading what I wrote, I understand it was out of order, probably because English is not my native language and I didn't pick right phrases/words. Please take my sincere apologies for this, I really didn't meant to be rude or anything. And Thanks for your review, it's highly appreciated! P.S. Most likely emotions played a bit on me, as we do so much for bloggers, giving away product samples for give-aways, charity events and reviews. But it was totally wrong from my side to assume that everyone will know how to use our products (even though apart from crushed shells, everything else can be used on natural nails). I'm glad Una has taken the time to come back and re-read the posts and make an apology. However, it would be good if there can be confirmation that intructions and warnings will be put on packs going forward? Una, thank you so much for coming back to apologise. I appreciate it. I said nice things about your company and intended to purchase from you as I really enjoyed playing with the bits I received. I spent literally hours trying out your products and it took a lot of effort so thank you for appreciating my review, I really did put a lot of effort into it. I think my review was fair. I do understand how it must hurt to not read 100% glowing reviews of your products, especially when you work so hard, but overall I really did enjoy using the bits and will now consider ordering from you in future. Perhaps not stickers though! great advice for buying nail art - i'm far from creative so i would have had no idea what to do with them haha i love the flower decal!!! Charlie, great post. Loved the designs you came up with. I received some samples to play with too, and whilst I haven't tried them all out yet, I was pleased with what I did try. I haven't tried the stickers yet, but I have tried the water decals. I admit, I was totally unsure of how to use them, but there are YouTube videos created by Una that are on the Viva La Nails website. It would be handy to have a small set of guidelines in such packs, but I don't think it's rocket science to work out how to use most of the different items. I'm glad I read this though as I had no idea that the crushed shell couldn't be used on natural nails. Eek. Glad I saw that before trying them! Omg!! I want, I want, I want!!!!!!! I love the green and the crystals sooo pretty! Going to go have a look at the site!